Coffee. Drawing board. Paper. Pencil. Subject. This should be the perfect situation for creativity but I am struggling for inspiration. Around me, other artists are producing absolutely beautiful images with no more exciting media than I have. I look up and there are some walking Mondrian paintings performing a sort of dance. It doesn’t really matter that I am drawing nothing more exciting than the person who happens to be sat opposite me. The most important thing is that there are loads of people here making drawings, making a mess, listening to music and having a lovely time. As the biennial draws to a close, the events and marketing starts to shift focus from what is happening now to the, as yet, nonexistent legacy. Those of you who attended the event Changing the World From Here on Friday evening, will already have a good idea of the Biennial’s immediate plans and their hopes for the future. The Biennial will I am sure be pleased to know that the last weeks of my festival experience have been characterised by positivity and pure enjoyment. Although I haven’t managed to see every exhibition (fortunately not all of the exhibitions are closing this weekend: Paul Rooney at Victoria Gallery is one I haven’t caught yet, but it is on until 22 December) I am glad that I focussed my energies on attending three events in the last week, all of which were inspiring and surprising. The first was Drawing Sessions 2, in Camp and Furnace, co-led by the Drawing Paper, the Royal Standard and the Biennial, and heavily promoted by Tate Liverpool as it links to their new show. The duo behind the Drawing Paper were shortlisted for the Liverpool Art Prize for producing their free quarterly newspaper-format publication showcasing contemporary drawing. Although I am still sad that there hasn’t been a venue to step in and offer the sort of ambitious installations that were the speciality of A Foundation, new Greenland Street residents Camp and Furnace have succeeded in creating a multi-purpose space where a diverse mix of people feel at home. Drawing Sessions worked very well in that context; a little bit wacky, intense, immersive and family friendly. The next event was an ‘experts meeting’ at Homebaked Anfield, my first visit to the bakery since the summer (the Anfield Home Tours have been fully booked for weeks). While the DIY aesthetic remains, it has moved on since the last time I was there and there is now a hygienic environment where volunteers can start producing some food. Maybe it was because this event occurred during an emotional week for me, but this talk made me feel as though my heart was filled with energy (in a way I hadn’t experienced since Lynn Hershmann presented her film Woman Art Revolution at LJMU Art Academy in the run up to Liverpool Biennial 2010). Sally Tallant was the chair, and the two guests were Jeanne van Heeswijk and Katrin Bohm. The idea was to reveal a bit about how artists working the field of participation (as these two are) come to work in that way, and how their projects start. The skill of the participatory artist seems to be in generating and galvanising strong emotions. Their work also takes time; it’s intense and requires fierce belief in the power of art to generate change. Artists working on participatory projects ~ such as Homebaked ~ tend to have a background in architecture, or work closely with architects who understand the importance of housing, however appreciate that housing alone won’t change people’s lives. Katrin was an architect, but her practice now is so open it defies definition; she ideally works from an open brief (“someone says to you that they want to do a project, but they don’t know what”) and her intention is always to break down traditional roles. Some of what the artists were saying could be interpreted as cheesy or naïve but personally I found it inspiring to listen to artists with such a utopian agenda, who are actively doing something to make the world better. Sally describes these artists as “a pollutant” or an “irritant”, which sounds negative, but the now Director of Liverpool Biennial has a history of supporting this kind of practise, and worked with Katrin in her previous incarnation as Head of Public Programme at the Serpentine, London. These networks and long term associations are vital to artists working in this way. Jeanne has been in Liverpool for over two years, which demonstrates that change doesn’t happen overnight and is also a testament to her personal belief in this project. After the talk finished, a camera crew started to set up to film Jay Raynor judging a bake off. As the critical debate segued into a light-hearted One Show feature, the bakery demonstrated the versatility that will ensure its longevity: and that when food and community are your trade you can actually be all things to all people. From participation to a much more traditional form of art: I was one of the sizeable crowd last Tuesday that wanted to find out more about the painting Sighting by Elizabeth Magill (pictured), on display in the John Moores Painting Prize exhibition. The prize is one of the key strands of the Biennial, which ensures that every two years British painting is examined and placed within the context of international contemporary art. 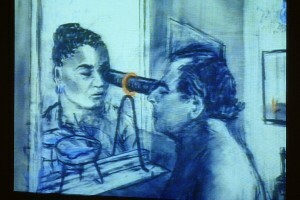 Being shortlisted for the prize isn’t Elizabeth’s first association with the city; in 1994 she was the artist in residence at Tate Liverpool, sponsored by Momart. This gave her an opportunity to step out of the “London bubble”; a comment that resonates with the ethos of the John Moores Painting Prize, which was deliberately established in a regional city. It was only at the end of the week that I discovered the rapt audience at Elizabeth’s talk shared their appreciation with the majority of visitors to the Walker Art Gallery, who had voted for her to win the visitor’s choice prize. Hearing the audience gasp in wonder at Elizabeth’s work (even as images in a PowerPoint) is convincing evidence that painting still affects people deeply. Elizabeth revealed that she lives with her paintings for four years, layering and reworking until “they don’t annoy [her] anymore”. Her paintings seem to speak to the soul of the viewer: conjuring up memories of any lonely natural beauty spot seen in childhood or the recent past. She cannot explain what makes her paintings “work” but she describes them as simply a way to build an exterior space to explore interior ideas. 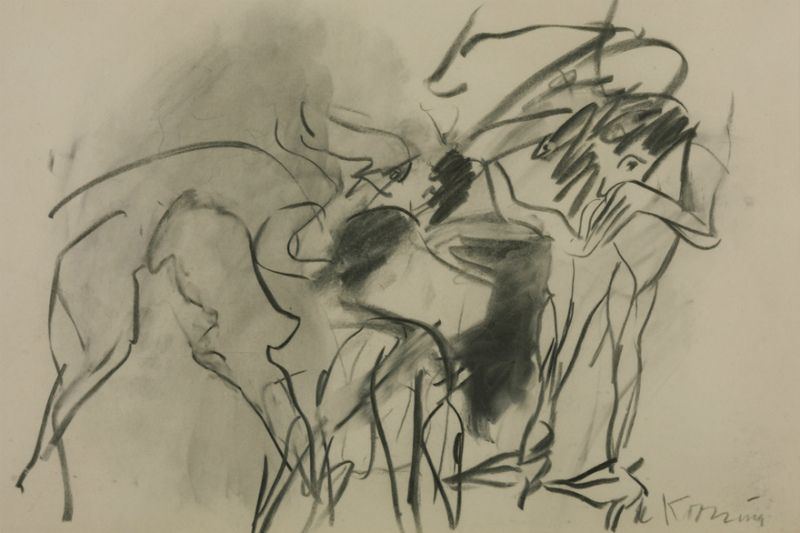 For such an accomplished artist, she has a very democratic view of art production, in particular drawing, about which she says: “I draw as I am waking up… anybody can draw… only comparisons with other artists can stop you”. A sentiment definitely shared by the co-hosts of the Drawings Sessions. It is the end of the festival and so Liverpool is back to business as usual. There are new exhibitions opening, many of which look really great. Tracing the Century at Tate is worth a visit (read my review here) and there is a new show opening at Open Eye in a couple of weeks ~ A Lecture Upon a Shadow ~ which looks intriguing. The cultural richness of the city, the reason that the Biennial was established here, is still apparent as the sea of the festival recedes, leaving a legacy through long-term projects such as Homebaked. New endeavours are setting up, new links are being made, artists are preparing to adapt and fight to continue what they are doing, and life goes on. I sat down on Sunday to write my forth Biennial blog and I realised… I hadn’t actually seen any of the Biennial in the last two weeks. This isn’t strictly true as I went to the Random Acts symposium at FACT, which was promoted as part of the Biennial; but there is so much to say about this event that I am covering it separately. Otherwise, I went to the Homotopia launch (more about that later) and… that’s it. This can only be biennial fatigue. In an effort to re-engage myself with the festival, I pulled on a waterproof jacket and braved rainy Liverpool. Having been quite event focussed, I had yet to see the ‘Unexpected Guest’ exhibitions at some of Liverpool’s core contemporary art venues. However, my first port of call was a space adjoining the Monro gastro pub on Duke Street, curated by the Biennial team. Tempting as it was to duck in to Duke Street Espresso or Sound Food and Drink, I remained committed to my mission and found Biennial A-board number 9. In the interests of producing a meaningful relationship between the Biennial artists and the city, over the summer the Liverpool Biennial curators brought several of the artists up to start a dialogue before the festival. They opened some of these events up to other curators and members of the public. One of these talks introduced me to the fascinating Australian artist Dane Mitchell (pictured). One question had niggled me while listening to him talk though: what could an artist from the other side of the world have to tell me about Liverpool? It was actually the exhibition Thesholds at Tate Liverpool that took this conundrum as a starting point. The exhibition begins with an analysis ~ through the work of Keith Arnatt, George Shaw, Mark Titchner and others ~ of British identity. It then goes on to investigate migration and territories. These are some of the big themes of our times; in art, the media and academia. What defines us as British? What defines art as British? What makes it international? This prompted me to think about the relationship that visiting art has with visiting cities. Although I am a resident of Liverpool and work in the city, I live 8 miles south of the city centre so it feels like I have to make an effort to spend my free time there. As a cultural tourist, all elements of the make up of a city can affect the way you read and understand the art you see. For me Liverpool is home and the ‘Unexpected Guests’ feel like they are my guests, but I have a complicated relationship with the city and on occasion see Liverpool at its worst. Back in the Monro, the first artwork I encountered was wallpaper designed by Mitchell, repeating the equation “host + guest = ghost”. Even having listened to Mitchell talk about his interest in etymology and knowing it was a nod to conceptual art godfather Marcel Duchamp, the wallpaper felt a bit ~ no pun intended ~ flat. However, also on display were several of his blown glass objects full of air from the lungs of people telling ghost stories. It was a pleasure to see these fragile sculptures heavy with meaning tucked away in a little corner of the city I hadn’t seen before. On the table near to Mitchell’s ghost story vessels, was a silver spoon cast with the inside of a mother’s hand at one end and the teeth of child at the other. This could have been made by Salvador Dali but was in fact the work of contemporary NYC-based artist Janine Antoni. All three artists’ work at the Monro combined a Whitereadian restraint with fanciful surrealism. In the farthest rooms artist Markus Kåhre offered an installation so simple and perfect I won’t spoil it by giving away the twist. From the Monro I went to the Tate and from there I walked the short distance to Open Eye. Since opening at its new location in 2011, Open Eye has invested in a series of architectural commissions on the facade of the building. Sintra Tantra is responsible for the jazzy offering during the Biennial period. Although I like the way her work interrupts the corporate atrium outside the gallery, it feels like all the stops have not been pulled out for the festival and it is basically business as usual. Inside, the lens-media specialist space is showing the work of Kohei Yoshiyuki downstairs and Mark Morrisroe in the archive exhibition space; both are fun but standard Open Eye fare. I enjoyed the process of viewing Yoshiyuki’s photographs, using a torch to illuminate his highly suggestive vignettes in the dark. Elsewhere, the Bluecoat seemed to be trying to combine narratives around identity, with the sensitive curatorial approach used at the Monro. It did this fairly well by selecting some beautiful genre-bending pieces like Sun Xun’s projections combining new media and traditional Chinese painting, showing John Akomfrah’s engaging multi-screen investigation of identity and memory and Dan Graham’s barely-there pavilion. The only work here that jarred was Dora Garcia’s ‘live talk show’, which at the time I went was an empty room crying out to be populated for some sort of event. Earlier last week I had attended a very spectacular event, not part of the Biennial this time. Thursday marked the launch of Homotopia, the annual LGBT arts and heritage festival delivered by an organisation based in Liverpool but expanding its reach all the time. At the opening, visitors had access to Council House Movie Star, an artwork that was funny, sad and extreme, which occupied part of the building on Greenland Street that until 2010 was used for ambitious commissions under the auspices of A Foundation. It blurred the boundaries of video, theatre and installation and involved drag queens dancing in the living room while their stereotypical scally kids looked on. The evening showed another side to Liverpool, one that confronts and then laughs at its problems, and one that I am glad exists. In many ways this Biennial seems like an art festival for austere times, without the drama and fanfare of previous Biennials. The Unexpected Guest exhibitions seem to be going for complexity but understatement. My Biennial ~ and non-Biennial ~ experiences this week were an important reminder of all that art can be and achieve: analysis of big issues, spaces for reflection, aesthetic pleasures and the ability to challenge and change the way we feel about the city we live in. I am drinking cold ginger and thyme tea from a teacup in a forest on a Friday night. Anticipation hangs in the air as our small group swells in number. Our hosts are present but absent. We must all possess masochistic tendencies, as we knew this evening was going to be inhospitable, but… here we are. Like any gathering of strangers there is some small talk. It is a bit like that first day of university, or like when the Big Brother contestants enter the house for the first time and are plied with booze. Is there gin in this tea, by the way? This evening was the first of two Inhospitable Supper Clubs at Wolstenholme Creative Space (WCS) in association with Leaf. The advertising blurb described it as “a three-course meal and a dining experience exploring themes of social constructs”; it is part of the Unexpected Guest strand of Liverpool Biennial and is an attempt to disrupt the ‘host’ concept. If you have a ticket to the second one, the following might contain spoilers (the event is now sold out). The forest is actually an art installation called The Inhospitable Landscape, which has very successfully transformed the space so that it feels like an inverted cabin in the woods; the perfect setting for a horror film. There is bark underfoot and rustling in the leaves and the floor boards above are creaking. The chat around the table is pleasant and the food is delicious. The Big Brother reference wasn’t totally flippant as the event is being streamed live on the internet, which (perhaps due to the wine served with every course) we soon forget about. Suggestion, however, is a powerful force. As the meal goes on we start to wonder just why it has been so pleasant. The rustling starts to feel a bit unsettling. What are those footsteps? Is there something under the table?! All of a sudden one of the other guests is standing on her chair and there is much shrieking. As the shrieking subsides there is a bit of finger pointing – was it you? Did you see the table cloth move just then? But before anything horrible happens, the evening was over. Was the event a bit miss-sold or was the word ‘inhospitable’ enough to give what would have otherwise been a very nice evening a bit of an edge? This wasn’t the only piece of performative art that took place during the last two weeks. The Royal Standard – another artist-led organisation who were made an official partner of Liverpool Biennial 2012 – opened the second of their five-part Service Provider programme this week. Fran Disley, one of the TRS Directors, says that “the intention of Service Provider was to interrogate what we [TRS] do by inviting other similar organisations to deliver projects in our exhibition space that offer an interesting response to this notion.” This week saw the opening of ‘The Agency’ conceived and delivered (performed?) by Generator Projects from Dundee. “Hello! Welcome to the Agency. Would you like to browse our products? Please take a number, one of my colleagues will be with you now.” A woman in her 20s or 30s, fuchsia lipstick, quiff, pencil skirt, greeted my friend and I as we arrived at lunchtime on the opening day. She gestured towards her colleague in identical costume, sitting behind a desk. Before we had time to think about the way that the space was used, or the way this subverted the ‘exhibition’ experience we expected, we were thrown straight into the role of customers and compelled to play along. Agency staff signed us up to the ‘artcrawl’ tour on Long Night before we even realised that we were both working that night and wouldn’t be able to go. Since our visit, judging from twitter, the Agency has mostly been engaged in a string of raucous office parties. I am sad to miss the artcrawl as I am sure that it will be a hoot and I urge anyone who hasn’t already to swing by and sign up. The exhibitions I saw this week were also both linked to the idea of transforming or ‘repurposing’ buildings. The first was the Cunard Building, where the Liverpool Biennial team have curated their flagship Unexpected Guest show. This iconic building housed the waiting areas for passengers of the White Star Line until the 1960s and it is a powerful backdrop to the exhibition. The artists and the ideas here are very international (which is fitting in this location) but, on occasion, attempts to bring the conversation back to Liverpool are heavy-handed. Where it is done in a subtler way it works better. Project Curator Rosie Cooper tells us that when she bought a school group to see Ponte by Mikhael Subotzky and Patrick Waterhouse, they thought it was Liverpool and tried to look for their homes, when in fact the artwork was made in Johannesburg, South Africa. The piece slideshows though views from the windows of a tower block going up the floors, unintentionally demonstrating that cities the world over share the legacy of failed ‘utopian intentions’. Lastly, and perhaps most geekily exciting in terms of access to a space was my visit this week to the Copperas Hill building. The former Royal Mail sorting office, now the property of Liverpool John Moores University, is the location for the Bloomburg New Contemporaries and City States strands of Liverpool Biennial 2012, as well as housing a new commission by Jorge Macchi, which is part of the Unexpected Guest. The New Contemporaries was the usual rag bag of recent graduate work, some of which was elegant and confident (I especially liked the work of Jackson Sprague who made sculptures and wall-based work that seemed to flow effortlessly from the same spring of inspiration) while some clung to a tiresome YBA vocabulary (see the ceramic squirrel). As we ascended the building to see City States, we became quite involved with the story of the closure of the building and the re-housing of the sorting office to Warrington. The notice-boards, clocking in machines and machinery of sorting have all been left untouched like ancient monuments (even though the building was in use until 2010). We assumed that this will change when the university re-purposes the building again into class rooms, studios or whatever it has in mind. I recommend you visit to see it in use as an art gallery in case you never have another chance to see inside. The City States exhibition itself contained some individually fascinating works but the overall narrative was hard to engage with. My favourite piece was the deadpan but fantastically ambitious installation Black Pillow by Audrius Bučas and Valdas Ozarinskas. This year repurposing and transforming buildings seems to have taken precedence over artworks in the public realm. This is sad because in previous Biennials pieces of art that interrupted the fabric of our everyday lives were a staple. They helped to give the city a buzz and also to engage people without having to step over the threshold of an art gallery – something that is still a fearful or reluctant experience for many. Perhaps there are cost limitations to public realm work and maybe they are not seen as the most cutting-edge or critically challenging (the Abba house from Liverpool Biennial 2004 in particular was a mysterious entity). The memorable experiences this year are definitely things like the events programme of the artist-led spaces and the opportunity to see some of Liverpool’s hidden architectural gems. It takes a bit more time and effort to see the exhibitions and go to events but sometimes, sadly, the art isn’t the highlight of the show.